The Mountain Bluebirds (Sialia currucoides) - also known as Arctic Bluebirds - are small thrushes that are easily identified by the males' vivid bright blue plumage details. 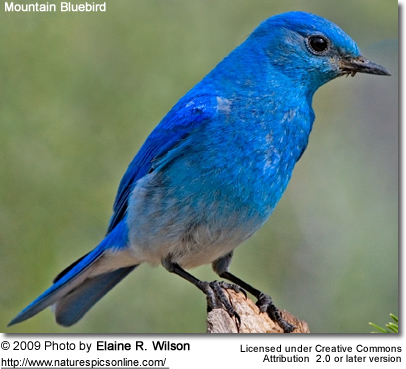 In fact, the Mountain Bluebird has the bluest plumage of all North American bluebirds. This is the state bird of Idaho and Nevada. During the spring and summer (breeding season), these birds are usually seen alone, in pairs or - towards the end of the season - in small family groups. 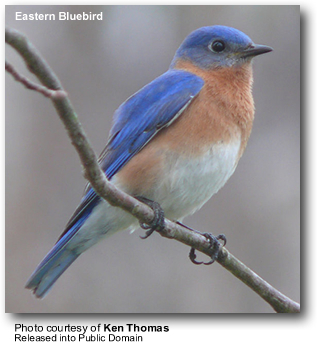 Records of interbreeding with other Bluebirds exist: Mountain and Eastern Bluebird hybrids and Mountain and Western Bluebird hybrids have been reported in areas where their ranges overlap. Mountain Bluebirds breed as far north as central and eastern Alaska, ranging south through western and central Canada (southern Yukon and western Manitoba) to western parts of the USA (east of the Rockies). Northern populations are entirely migratory - they travel south to winter in southwest United States - south in the mountains to southern California, central and southeastern Nevada, northern and east-central Arizona, southern New Mexico and east to northeastern North Dakota, western South Dakota, central Oklahoma and central Texas. From there, they range south into western and central Mexico. 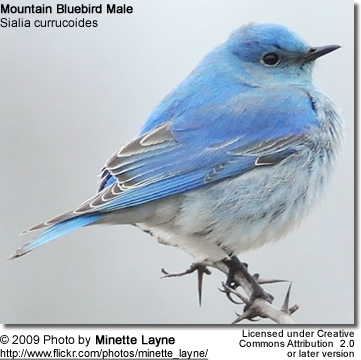 Most of the time, Mountain Bluebird migrate in flocks of up to 50 birds. They travel slowly, frequently interrupting their journeys to feed. The spring migration takes place between February to April, and they usually return to their wintering range around October, when temperatures drop and food sources become scarce in their breeding range. Southern birds, on the other hand, are often permanent residents; although they move to lower elevations in winter. Resident (non-migratory) populations are found in the mountains of central and southeastern Nevada, southeastern Oregon, southern Utah and Colorado, northern Arizona and New Mexico. Vagrants have been reported further east of their natural range as far as Cuba. They typically nest at elevations greater than 7,000 feet (2,100 meters). They favor open territories with scattered trees, bushes and short grass - such as alpine meadows and clearings, as well as lower elevation grasslands, plains, fields, farmland, pastures and gardens. They are often seen perched on fence posts or wires. About two-thirds the size of the American Robin. Juveniles have a mostly brown-grey plumage with some white or buff spotting (but less so than the young of the other bluebird species). There is a blue wash on the wings and tail. As they mature, the blue color becomes more prominent and any spotting disappears. 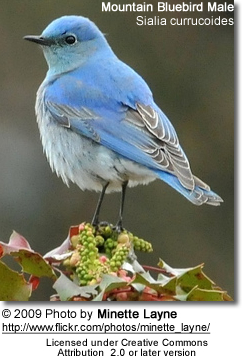 Bluebirds: The male Mountain Bluebird's all-blue plumage differentiates it from the other North American Bluebirds. Eastern Bluebird (Sialia sialis): Stockier than the Mountain Bluebird. Shorter wings. 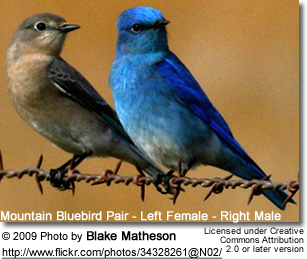 Blue markings are darker than those of the Mountain Bluebird male's. The male has extensive orangey - rusty markings below. Females have brighter orangey markings on the chest, a thicker bill and lack the broken white eye rings. Western Bluebird (Sialia mexicana): Blue markings are darker than those of the Mountain Bluebird male's. The male has extensive orangey - rusty markings below that may extend to the back. Females have brighter orangey markings on the chest. Thicker bill. 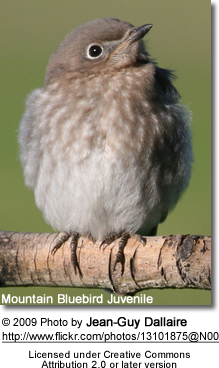 Lack the female Mountain Bluebird's interrupted white eyerings. Indigo Bunting (Passerina cyanea): Paler bill. Plumage color is more of a turquoise-blue. Townsend's Solitaire (Myadestes townsendi): Lack any blue in the plumage. Overall a more slender build. Only the females could be confused. But has shorter wings that don't extend to the tip of the very long tail. White outer tail feathers. Also have buff-and-black patterns on the wings which includes a long buffy wing stripe that is most commonly seen in flight. Unbroken white eyerings. During the summer months, adult bluebirds mostly feed on insects and other invertebrates, including grasshoppers, crickets, grasshoppers, caterpillars, katydids, beetles, as well as earthworms, spiders, millipedes, centipedes, sow bugs and snails. They hunt insects by hovering over the ground and flying to the ground to capture them, or they catch them in mid-air. They typically fly back up to their perch to feed. These insect-eating birds are helpful in controlling insect populations without the use of toxic pesticides. During the winter - when insects are less available - their diet is made up of wild fruit, plants, such as blackberries, bayberries, pokeberries, honeysuckle, dogwood, red cedar and wild grapes. They will also take seeds, grains and nuts, or visit bird feeders with mealworms. Mountain Bluebirds form monogamous pair bonds. Breeding occurs in the spring and summer. Males generally arrive at the breeding site before the females, giving them time to identify suitable nest sites, which are often natural tree cavities, abandoned woodpecker holes, rocky crevices or artificial nest boxes that are usually several feet above the ground. The male initiates the breeding season by taking materials to potential websites and displaying to the female by waiving their wings while sitting next to their chosen nest sites and singing and calling to the female to attract her attention. If the female accepts him as her mate, she will take over and construct a small cub-like nest alone inside the crevice or nestbox that the male has chosen. She uses stems, grasses, pine needles, roots, plant fibers, bark and other materials found in her environment. She lines the nest with finer grasses, feathers, down, and mammal hair. The nest is usually completed in about ten days. The male will aggressively guard her and the nesting site. Once the nest is complete, the female lays 3 - 8 eggs - the average being 4 - 5 - at a rate of one egg per day. The unmarked eggs range in color from white to pale blue. The female alone incubates the eggs for about 13 - 14 days. The hatchlings are mostly naked with only little down; they are blind and entirely depend on parental care. Both parents feed them and fiercely protect the nest. The young will remain in the nest for about 21 - 23 days before fledging (leaving the nest). However, they usually stay with their parents for another two months. Up north, pairs typically produce two broods in a season, and further south up to three. The number of broods depends on local weather conditions and availability of insect prey (food) needed to raise the young with. The chicks require a diet rich in protein to support their rapid growth, so their diet at this stage is almost entirely made up of insects. Its call is described as a soft few and its song as a rapid, chirping warbled high chur chur. These birds are generally not very vocal. The average lifespan of Mountain Bluebirds is 4 to 6 years. They have the potential to live up to 10 years or even longer, but most of them don't make it through the first year due to harsh environmental conditions during the nesting period to some extent, but primarily they fall victim to predators, such as squirrels, chipmunks, domestic cats, raccoons, and larger birds. The numbers of these bluebirds are stable at this time, and, in fact, appear to be increasing in many areas. Many believe that this can be attributed to the growing numbers of available Bluebird nestboxes and the increasing willingness of bluebirds to use them. In remote areas, Mountain Bluebirds are less affected by competition for natural nesting locations by the more aggressive Sparrows or Starlings (found mostly in urban areas) than the related Eastern or Western Bluebirds.